Can the striker score a goal in the World Cup in this simple timing activity? 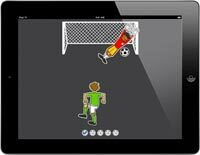 Touch the screen or press an external switch when the striker is in front of the goal. Score five goals to get a reward. This accessible and inclusive game has been designed to encourage and develop hand-eye coordination and switch timing skills. Auditory prompts and a clear background with bright objects make this an ideal game for children with visual and perceptual difficulties. Choose the easy level and the player will wait for you to kick! Ideal for early hand-eye coordination. Auditory prompts and clear graphics for users with visual difficulties. Easy skill level for errorless operation. Hard level and speed control to increase difficulty. A fun way to develop switch timing skills and anticipation. Learn to wait - press too soon and the player misses. Switch access for one switch is included. Switches can be connected via a Bluetooth switch interface.